We, the investigation committee, want to document unlawful behavior and violence on the part of the police or RWE employees. Remember that in your report, you should not incriminate yourself nor other activists, so do not write us what you and others did or did not do. Add the exact location and time of what happened. If you should have photos, videos, medical certificates, or other evidence, please attach it to your report. Please also write if we are allowed to publish your report or parts of it. 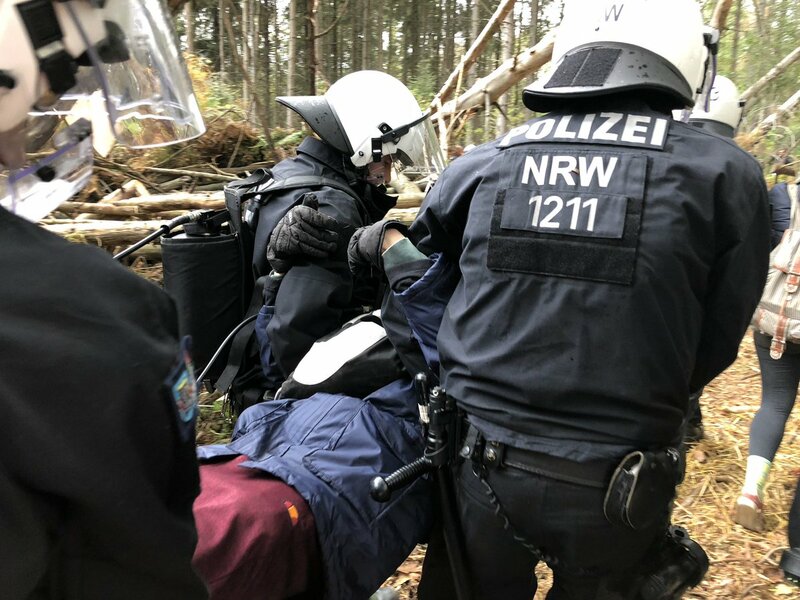 Anyone who subsequently receives mail from police, prosecutors or courts and desires support, can contact the Anti-Repressionsgruppe Rheinisches Revier (Anti Repression group Rhenish Mining area). We recommend that you write a memoir of the experience and keep it somewhere safe. With such a memory record, it’s important that you only describe, with accurate time and place information, what happened and not what you or others did. It can help you later in a possible trial preparation. Another support structure in case of repression and also information about current prisoners can be found on the blog of ABC Rhineland. If you should want to talk about what you experienced or if you should need emotional support, you can contact Out of Action. They provide emotional first aid to affected individuals and groups.